Native to Europe, dandelions crossed the Atlantic with European immigrants four centuries ago, and they have taken over millions of backyards since then. But this bane of many landscaper’s existences is bursting with health benefits for those enlightened enough to eat it. In fact, dandelions were prized for their medicinal properties over a thousand years ago. Their roots and leaves contain significant amounts of vitamins and trace minerals, making them a proven way to boost your nutrient levels and restore health to your body. As the name implies, dandelion tea is made from infusing dandelion roots, leaves, or blossoms in hot water to release their beneficial compounds into it. Your tea will vary in flavor and nutritional value depending on the portion of the plant you use. For example, dandelion root tends to be best for treating liver ailments, the leaves work for the kidneys, and the flowers offer the most subtle flavor and benefits. Not interested in harvesting your own greens? You can also purchase organic dandelion tea bags to still enjoy the health benefits. 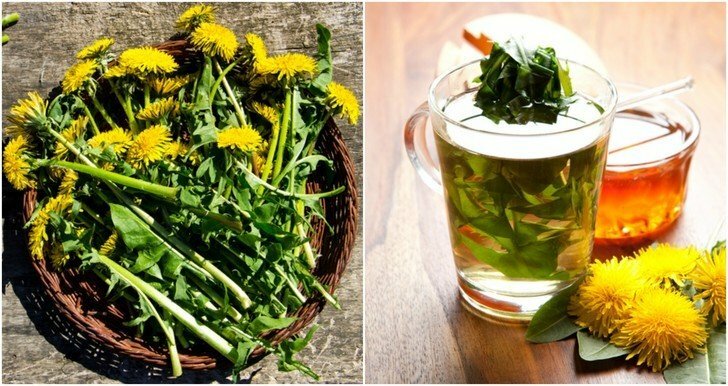 When it comes to healthy uses for dandelion greens, dandelion tea is just the beginning. You can consider these wild greens to be like spinach or arugula and put them to use in a variety of recipes, including as a salad ingredient, sandwich, or sautéed side dish. Just keep in mind that the bitter flavor of wild greens can overwhelm the flavor profile of a recipe, so you might want to blend them with a milder vegetable to keep things balanced. Below are some recipe ideas to act as inspiration. Mix fresh basil with dandelion greens for an antioxidant-filled pesto variation. Saute dandelion greens for a seafood topper to add some zest to blander varieties of fish. Boost the nutritional profile of your morning smoothie by tossing in a handful of tender dandelion greens. Incorporate the greens into a vegetable broth with mushrooms and white miso for a light summer soup. Make “dandelion chips” by dousing the greens with oil and sea salt before drying them out at 350ºF for eight to ten minutes until crispy for a delicious alternative to the fried potato variety. Start experimenting with recipes for dandelion leaves today, and you’ll soon find dozens of ways to incorporate them into your regular meals. In no time at all, you’ll completely transform your previous views about this pesky weed and begin to seek it out for its health-boosting properties.